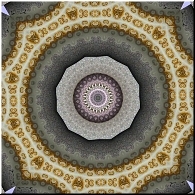 The Flatland Digital Artwork Clip Art Gallery: The Well (silver, dark grey, and gold mandala). The Well (silver, dark grey, and gold mandala). ABSTRACT DIGITAL ARTWORK. Multi-dimensional, optical illusions. a silver center devolving into concentric circles in dark blue, bold, silver, and white, surrounded by a "padded" or "quilted" outer circle in shades of grey and dark blue grey, surrounded by a scalloped outer edging in white with gold details. Complex yet elegant.